The answer was simple : “They were young guys, who wanted adventure and travel, their dream was not to stay in America or in Canada but to travel to see the countryside, visit the cities, compare the life in North America as opposed to the life in Czechoslovakia. That was a dream. The reality was quite different : the worldwide depression in 1927 caused a loss of jobs all over North America and Europe. This was the reason that the two brothers Vik and Frank Holly never returned home. Also, back home, in Europe-Czechoslovakia, there was turmoil and political challenges and upheavals.Eventually the clouds of war were on the horizon. The life that they had known back home, soon no longer existed. This was the reason that Vik and Frank had to start a new life far away from their native village Male Levare, near Bratislava. The rest is history: the war, the service in the Canadian Navy as an officer, marriage and starting a family. This is the answer to this question. Viktor wished to some day go home to visit or to stay but the Soviet Communism ended that dream. 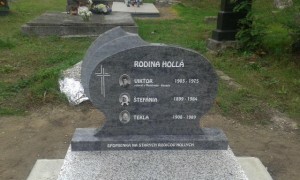 And I, Viktor’s son, James (Janko) Holly, and Valentina Nikolayevna Filina-Pattison decided to fulfill Viktor’s wish of many years ago to come home to Male Levare, to be buried with his two sisters Stephania and Tekla, and great grandparents side by side. This was an event that was in long time in coming. Nevertheless it came to be accomplished on October 27, 2014 with the gracious help of Tekla’s son Jan Holly, his wife Jana Holla and all their family. We thank God to have these people as close relatives and friends. BADEK NEWS 66. HAPPY NEW 2015 YEAR, MY DEAR CHERISHED READERS ! Янка и Валя! Ваша доброта и ответственность родилась раньше Вас. Вы молодцы! Низко, по-русски, кланяюсь перед Вами! Любовь моя к Вам – огромная!!! Милая Зоинька! Спасибо тебе, родная, за тёплые слова признательности. Сегодгя, т.е. 27 ноября 2014 года, идём в гости к Янкиной дочери Стефании, которая живёт в Эедри, 10 минут езды от нашего города Калгари, чтобы поздравить её и Эрика с рождением второго мальчика по имени Грейдон. Везём много подарков плюс приложение лично от меня: 600 долларов канадских. В добрый час на жизнь, маленький Грейдон!